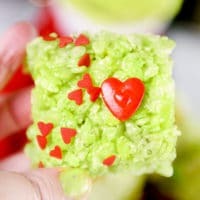 Any Grinch lover’s heart will “grow three sizes” when they bite into these cute Grinch Rice Krispie Treats! That lovable (although ornery) Mr. Grinch steals our hearts at Christmas for sure. These treats would be so easy and fun to take to any Christmas party! “The Grinch that stole Christmas” is a favorite story of ours at Christmastime. 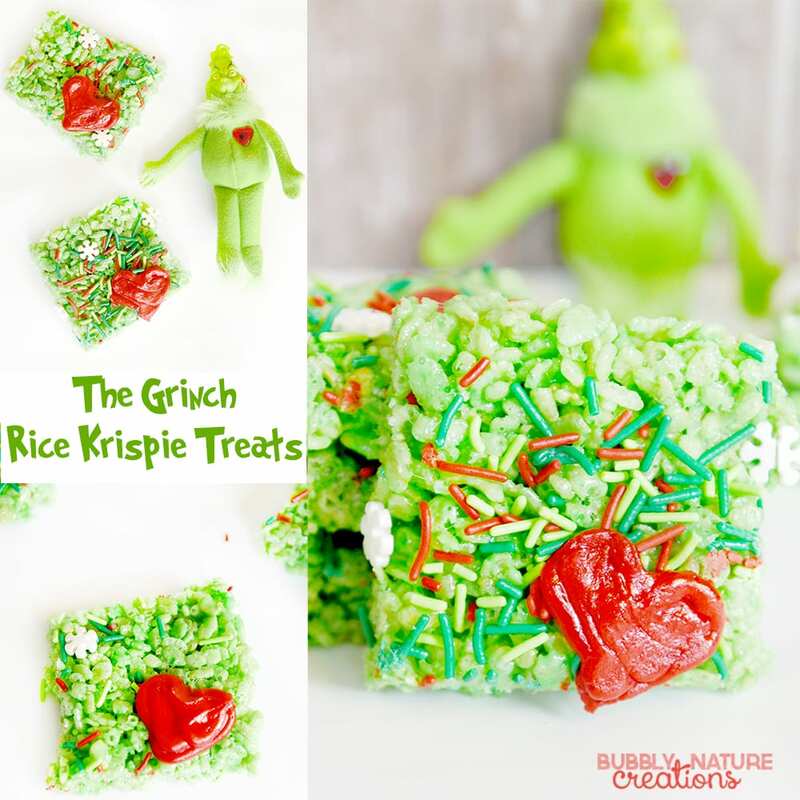 We love to read the book and watch the movie while munching on these delicious Grinch Rice Krispie Treats. My girls were already begging me to watch “The Grinch” on November 1st this year! We will probably watch it 2 or 3 times before the season is over for sure. 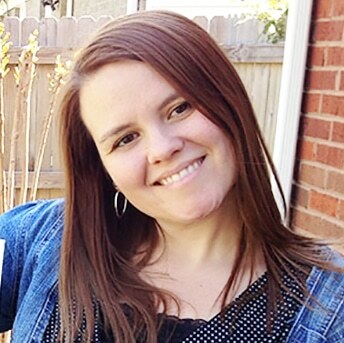 If you would like to skip my super helpful tips and suggestions for making Rice Krispie Treats and go straight to the recipe; just scroll down to the bottom of the page where you can see the recipe and print it out if you want. We are also excited to watch the new The Grinch movie coming up soon. I think I will take the kids as soon as it comes out. It looks like a really fun version for the kids. Are you going to see the new Grinch movie in theaters? My kids are counting down the days until it is released and I am sure we will be buying the DVD once it comes out too. Rice Krispie Treats are always one of my favorite go-to recipes for any get-together because they are well loved by everyone. Plus, they are as easy-as-cake to decorate. Just add in some color, maybe some flavorings and lots of sprinkles of course! The kids will love adding the sprinkles too and older kids will have fun adding in the coloring (with help). 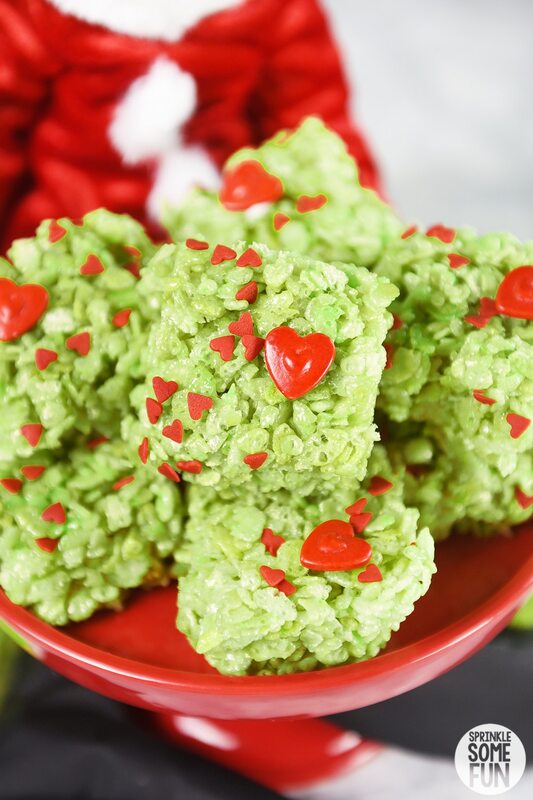 Easy to make and super cute… these Grinch Rice Krispie treats just might steal your heart. 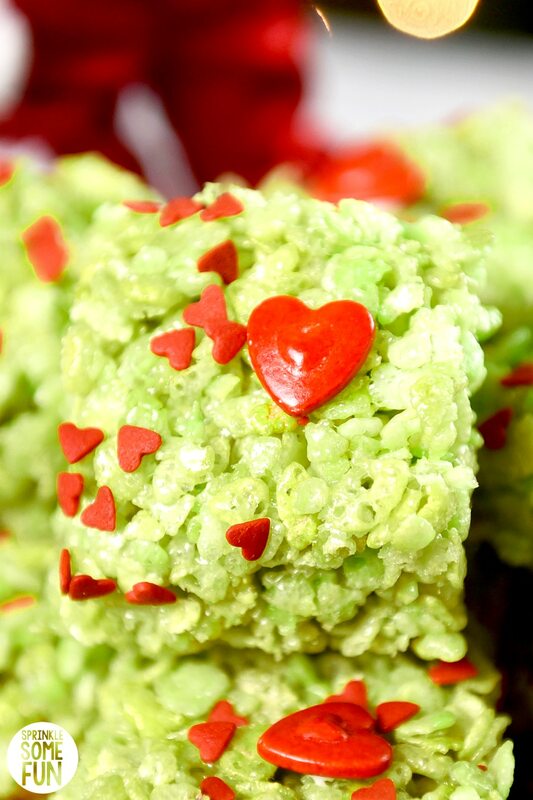 Add some flavoring like mint or vanilla to the Grinch Rice Krispie Treats. A tsp. of flavoring would be a nice touch for these Grinch Rice Krispie Treats! Mint or vanilla flavors are great for Christmastime too. Add Neon Coloring and regular green color for the best “Grinch green” color. Any green should work for these fun treats, but a drop or two of the “neon” food coloring like McCormick with a regular green food color makes the closest color to the Grinch. Just for fun add a Mr. Grinch plush toy to your table or just for the kids to enjoy. We love this adorable Mr. Grinch plush (affiliate) that is the same style as the newest movie in 2018. It’s the one shown the pictures above. Use tiny red heart sprinkles on top. We used these tiny red heart sprinkles (affiliate) from Amazon and they are perfect! Be sure to add them as soon as you press the Rice Krispie marshmallow mixture down so they stick to the top. Edible heart decorations or icing heart for a finishing touch. 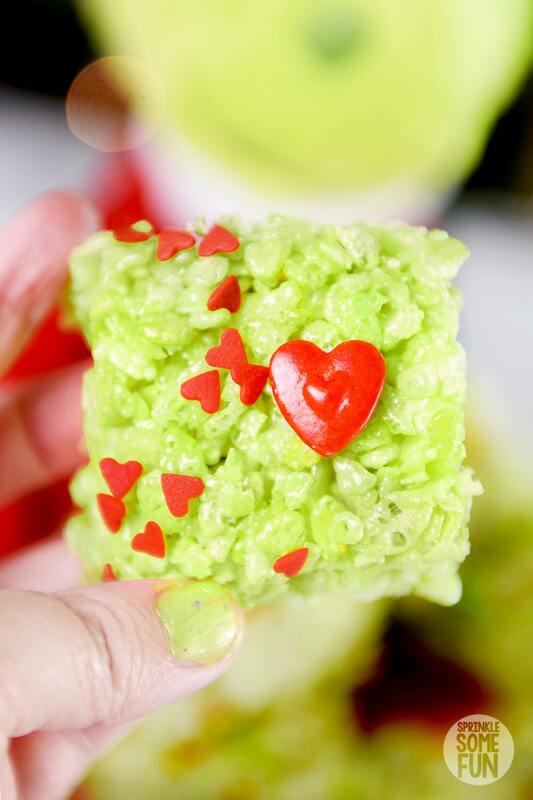 A larger heart on the Rice Krispie treats makes a super cute finishing touch. If it’s hard to find the jumbo double heart sprinkles like the ones that used; you can always make your own heart from red icing or use red melting candies to make them. I personally love to enjoy these Grinch Rice Krispie Treats with a tall glass of “green” colored egg nog. Yum! The rest of the family prefers chocolate milk or hot chocolate. I am going to try out some green colored white hot chocolate next and use the cute heart sprinkles on top too! Of course you can enjoy these with any beverage of your choice… you can’t go wrong! 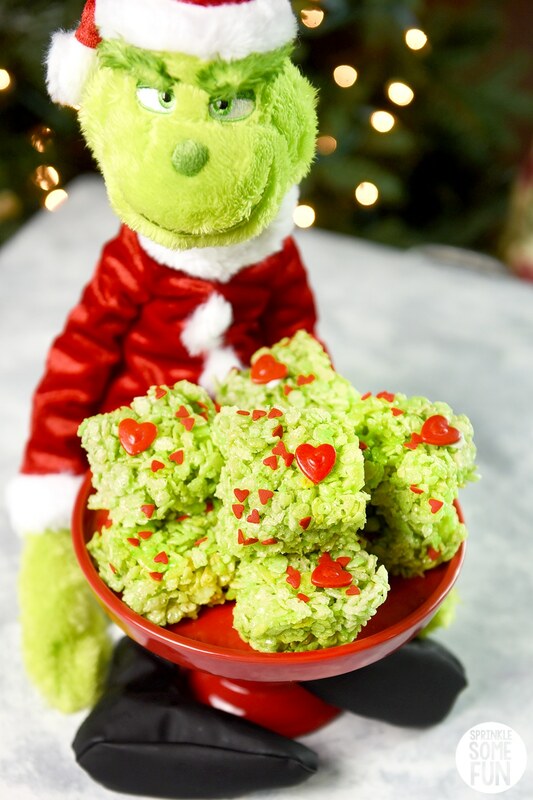 If you LOVE these Grinch Rice Krispie Treats, be sure to stop on over in my Pinterest Community to share a picture of YOUR completed pictures! Or share it on Instagram and tag me #sprinklesomefun so I can see it! Does your family love “The Grinch” as much as we do? Wrap them up for all your Grinch loving friends and family for the holidays! These make great teacher and coworker gifts as well. The first time I made these I passed them out to the nurses when I had my baby. They all loved them! I hope you enjoy making (and eating) these as much as we do! I think the Grinch himself would approve. These would also be a great treat to set out on Christmas night for Santa too. I hear he loves Rice Krispie Treats. 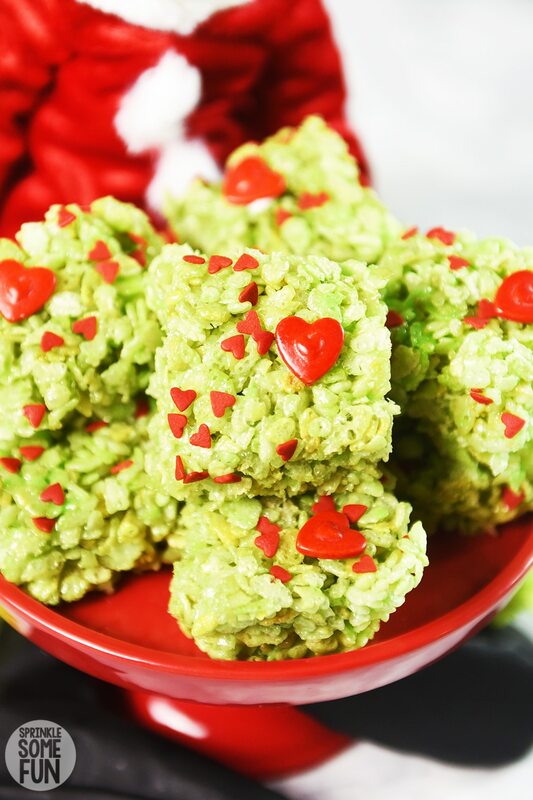 Any Grinch lover's heart will "grow three sizes" when they bite into these cute Grinch Rice Krispie Treats! Melt butter in large sauce pan over low heat then add the food coloring and stir. Add the marshmallows next. Stir constantly until melted and completely blended. Remove mixture from heat. Immediately add cereal. Stir until well coated. Using buttered spatula or waxed paper, press mixture evenly and firmly in buttered 8x8 inch pan. Add heart sprinkles or sprinkles of choice. Cut into squares when cool and then add an icing heart using the red icing OR (updated) use a large red heart decoration. If the decoration does not stick very well... just add a dab of icing or red melting candy to the back side to affix to the Rice Krispie treat. If using the icing: leave it to dry for an hour and the hearts will not be too sticky to the touch.